Rescue Related Encouragements, Musings, Poems, Websites, Resources, etc. Thread: Rescue Related Encouragements, Musings, Poems, Websites, Resources, etc. With the loss of the puppies this week, I have been receiving many kind notes. Several of the notes that great quotes that I needed to share with my fellow kind-hearted rescuers and rescue supporters. And if he could? he wouldn't. you gave him not to. like food, medical care, and love. and eyes truer than the sky is blue. and behave genuinely in all circles. are the best humans I've ever known. You cower and you cringe, pressing up against the wall. You tremble and your food dish has not been touched at all. Someone might come and hit you, and there’s nowhere for you to flee. Human faces look into your dark dingy prison cell. You look away, don’t meet their eyes, they might cuss and scream and yell. A ringing sound, the warden answers, a pause, then he looks up. He nods and listens, “Yes she is, a purebred too I bet. Her owner dumped her in the night, freezing, and soaking wet. She’s got the cough, you know the one, that wracks her body through. He hangs up then he looks at you, points his finger, and smiles. “It seems you got a break today, someone thinks your worthwhile. He chuckles, then he shudders, knowing you escaped the gas. The next day a woman enters, and is led to your cell door. She squints her eyes against the dark, then lets out a little cry. How could someone leave you here, knowing you would die? there’s nowhere left for you to go, you’re trapped within this cage. You close your eyes, await the pain, await the blows to fall. They never come, it’s quiet as you cringe against the wall. A soft voice whispers, “It’s okay. There’s no more pain for you. She slips a rope around your neck, then lifts you in her arms. She cradles and she kisses you, her touch feels oh, so warm! This angel takes you home with her, gives you food, a nice clean bed. She sings, and takes you out for walks, and strokes your silky head. One day she takes you for a drive, she smiles, “It’s time to go. She stops the car, and picks you up, one last kiss on your head. A teary smile, a fond farewell, your heart is filled with dread. Someone new now holds your leash, a man you never met! takes your leash and thanks the man, and says hello to you. She pats your head, and whistling, puts you in the car. In the back are two more dogs, they too, have come quite far. You meet more people, ride in their cars, and sometimes meet their kids. No longer scared, just worried, and wondering a bit. One kind lady takes you home, feeds you and puts you to bed. Another day, more changing hands, strangers cuddle you. take you to a nice warm house, that smells like love and….HAM! Three dogs come out that look like you, long hair, all black and white! They wag their tails in greeting, they’re friendly and polite. and over the days and weeks they give you love and light. at all your silly antics like when you escaped the bath! they never hit, they never scream, you never feel alone. a family with an empty heart arrives as if on cue. They come into your foster home, they look at you and smile. “Oh Mom and Dad! Look at her!” cries their excited child. “She’s beautiful! Look, see her scars? Someone hurt her there! Grey Lady watches wistfully out the window as you leave. You don’t see the single tear that traces down her cheek. Your child clutches onto you, your wagging tail held high. Re: Rescue Related Encouragements, Musings, Poems, Websites, Resources, etc. This thread gets me every single time. -- That we don't also love animals, even though we've taken minimum wage (or no wage) jobs in order to work with homeless animals. For many of us it is our life's work. -- That we, somehow, don't get our hearts broken. -- That in order to do this job one has to be either cold hearted or an animal hater. Your declaration leaves us with some questions. If you can't do this job, who will? Someone must. When we've euthanized the 500th kitten for the month, because there are no homes available, will you take the 501st? Our hearts are completely torn out and we just can't kill one more. You already have enough pets? We understand, we do too. Our cages are over capacity, our foster homes are all full. Do you have a solution? If so, please tell us, we hate this part of the job. Right now, at this moment, there is a dog or cat in a shelter employee's arms and there is no where on earth for this creature to go. There is no cage space, no foster home, no forever home. Nowhere. It is a heartbreaking feeling. There is a really nice yellow lab mix named Jake. He's 3 years old, healthy, housebroken, loves kids, loves everyone! But, he can't find a home because he's quite generic looking, he's not real flashy and he's not a puppy ("I want a dog to grow up with the kids"). We've had him here for 3 months, but can no longer justify taking up valuable cage space for a dog that's showing no signs of becoming adopted. What would you do? There are 10 dogs that came in today. We have two open runs. Who has to die? Walking through the kennel, having to choose which ones have no more time is the worst part. It breaks our hearts. If you know of a way to keep Jake alive and still be fair to the other animals, please tell us. We've grown so attached -- it's our hearts again you know -- they're breaking into a million pieces this time. Will you talk to the woman who brings in a blind, 10 yr. old peek-a-poo with bad skin and says "Don't kill her! Find her a good home!"? Oh puhleeeeeeze. We can't find homes for the healthy 1 year olds; who's going to adopt a 10 year old, unhealthy dog? You? Me neither. I already have four dogs that were considered unadoptable. Because this owner won't face reality and allow us to euthanize right away, the dog has to spend her last 24 hours on earth in a holding cage, wondering what happened. But, we held her as often as we could and tried to comfort her because you can't. It would break your heart. "Wait!" you say, "Someone might want her!" It's quite unlikely that there is someone that wants an elderly dog that needs a few hundred dollars worth of veterinary care. Our crystal ball is broken, but if you think she can find a home and you want to save her please go back to the kennel and pick which young, healthy dog has to give up its space here. OK. You can't work at a animal shelter. Not everyone can. Can you help in other ways? Can you buy us a bag of food when you buy for your own pet? Can you come in and talk to the cats? Walk the dogs? We are so busy running the place that we often don't have time. When you come back next week we won't tell you the final disposition of your favorite one if you don't want to know. We are, after all, a compassionate group and we understand about broken hearts. Could you go to your friend or neighbor and offer to get their pet spayed/neutered? Tell your friend about us and how we get our hearts broken every day. Could you trap one of those stray cats in your neighborhood and get it vaccinated and neutered? That will be one more free-roaming cat that's out of the reproduction loop. Maybe you could send a small check to say "Thank you". Anything at all would help. I know you mean well. I know you mean to say "I couldn't work here because my own emotions get in the way of doing what has to be done for the animals, thank you for doing it." "Folk will know how large your soul is by the way you treat a dog!" I'm a forever dog, not an 'until' dog. I'm not an 'until you get bored with me' dog. I'm not an "until" you find a girlfriend dog. I'm not an "until" you have a baby' dog. I'm not an "until you have to move' dog. Last edited by leesam; 02-28-2013 at 12:46 AM. What it is that I've done wrong. And left alone so long. When I came here as a pup. While I was growing up. As companion and as friend. Said they'd brush me every day. They often say I shed. Not even to be fed. They always say "Not now!" Won't someone tell me how? I wish they would explain. Then left me on a chain. Her name is Dixie. 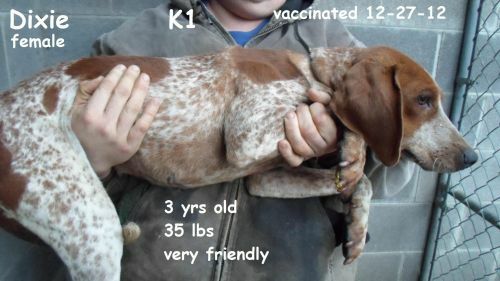 She's located in Hazard County, Kentucky. As obvious, she's a hound. In my over-active imagination, she has been adopted by two cousins who drive an orange Charger whose horn plays dixie. They have a attractive female cousin who regularly wears questionably revealing outfits. Her life will be filled with adventures foiling the plans of corrupt local politicians and evading inept local law enforcement. Yes, I grew up in the 80s.